HAYES, Charles Arthur, a Representative from Illinois; born in Cairo, Alexander County, Ill., February 17, 1918; graduated from Sumner High School, Cairo, Ill., 1935; trade unionist, 1938-1983, and served as vice president, United Food and Commercial Workers Union; elected as a Democrat to the Ninety-eighth Congress, by special election, August 23, 1983, to fill the vacancy caused by the resignation of Harold Washington; reelected to the Ninety-ninth and to the three succeeding Congresses and served from August 23, 1983, to January 3, 1993; unsuccessful candidate for renomination in 1992 to the One Hundred Third Congress; was a resident of Chicago, Ill., until his death on April 8, 1997. 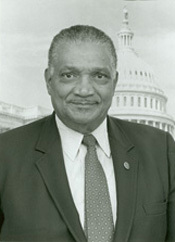 Charles Arthur Hayes in Black Americans in Congress, 1870-2007. Prepared under the direction of the Committee on House Administration by the Office of History & Preservation, U. S. House of Representatives. Washington: Government Printing Office, 2008.